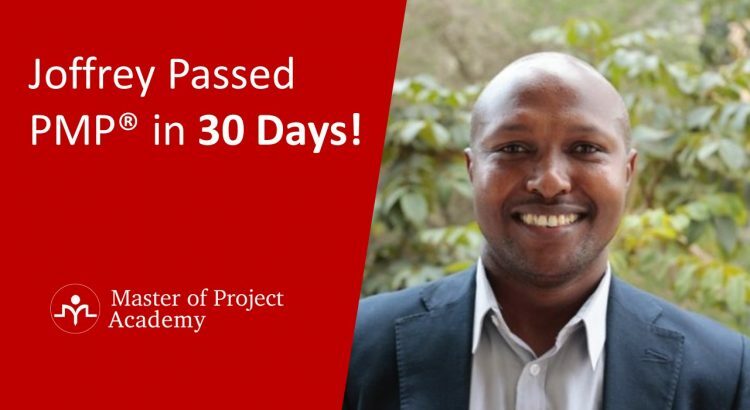 Joffrey Cheruiyot recently passed the PMP certification exam in 30 days! Joffrey did a PMP exam review with us and shared his tips & tricks for how to pass PMP exam. 1-How long did it take to pass PMP exam? I pushed myself to get ready and pass PMP exam in 30 days. I signed up for Master of Project Academy’s PMP training and followed the lectures carefully. I scored over 70% from end of section quizzes and sample PMP exams at the end of the PMP training. Right after I completed the training, I applied for PMP. Then, I sat for PMP exam right after I got my approval from PMI to be able to sit for PMP exam. 2-What was the biggest challenge for you when studying for PMP exam? Getting time to study was the biggest challenge. The season was fairly busy for me. Therefore, I had little time to study. I also have young kids who prefer to play with me in the evening. Master of Project Academy’s advantage starts here. I was able to follow the lectures on my own pace whenever I have time to study for PMP. I was studying nights after kids went slept or at work when I had free time to go through the PMP training. 3-How was the quality of Master of Project Academy PMP training materials? The PMP training materials of Master of Project Academy were great. I scanned through the power point presentations and did all the questions provided include the examination at the end, then went back listened through the tutorials, again doing all the questions provided and went through all the presentations a day before the exam. 4-How much similar were the questions in real PMP certification exam when you considered the PMP certification exam questions in Master of Project Academy’s materials? PMP questions of Master of Project Academy were too much similar with the ones I faced in real PMP exam. Practice questions of PMP training helped me to sharpen my readiness for PMP exam and helped me to pass PMP exam in the end. 5-How many PMP questions did you practice before the exam? I did all the questions provided on the tutorials. There were around 1,000 questions and I was scoring from 80% to 90% from quizzes and sample PMP exams. These questions helped me increase the chance of passing PMP exam. 6-How was the Master of Project Academy support during your PMP training? I did not seek too much support at the time of my preparations. Because, the materials were clear and concise. Instructor was responsive in discussion forums to clarify our questions. When I needed a support, Master of Project Academy team was always in touch in less than 24 hours as expected. 7-Do you have any recommendations for future PMP exam candidates? I would propose 2-3 months preparation. Going through the PMBOK, then starting the tutorials given will be a good path. Prepare a good PMP study plan to get ready and pass PMP in your first attempt. Relax, go through the questions well and use the tools given in the examination. For example, I used the highlighting feature to mark important words on the questions and striking through the options. This helped me to focus on the best options. Go through the PMBOK but do not try to understand every detail since it is tough to follow. Scan through the presentations and take all the questions given at the end of the sections. Go through the lectures and make notes on your handouts. These notes will help you to remember the concepts you already studied. Finally, how likely is it that you would recommend Master of Project Academy to a friend or Colleague? In a scale of 0 to 10, I would give 9.8 to Master of Project Academy PMP training. I would definitely recommend it to any PMP aspirant. Thanks for giving me this opportunity to share my PMP journey. You’ll be as happy as our 50,000+ professionals community. Joffrey is only one of them! 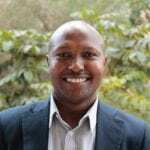 Joffrey has a Civil Engineering degree and works as Regional Manager at World Vision, which is a non-profit organization. Joffrey lives in Nairobi, Kenya.